The Biker Bar gives bicyclists a convenient place to rest while waiting at an intersection. The Saddle Buddy offers a spot for bicyclists to hang their bikes at trailheads or rest areas. People on bikes will no longer have to reach for the curb or a sign post to support them at traffic lights...or need to find a nearby tree to lean their bike on or a patch of grass to lay their bike down. Dero is proud to announce its newest products, the Biker Bar and Saddle Buddy. The Biker Bar gives bicyclists a convenient place to rest while waiting at an intersection. The Saddle Buddy offers a spot for bicyclists to hang their bikes at trailheads or rest areas. The Biker Bar is a leaning rail designed to give bicyclists a place to rest a hand and foot to balance while waiting at an intersection, never needing to dismount. People on bikes will no longer have to reach for the curb or a sign post to support them at traffic lights. The Biker Bar also acts as a push-off point, assisting riders in getting an efficient start from a full stop. This helps keep traffic moving efficiently and safely through the intersection. The Biker Bar also gives bicyclists a designated area to wait in a queue and out of the crosswalk, so pedestrians have a clear path. The Biker Bar is modular, so depending on the location, it can be extended to accommodate more bicyclists. It is easy to install and includes tamper-proof hardware. See the Biker Bar video here. The Saddle Buddy is a perfect amenity for mountain bike trailheads and park rest areas. Its simple design allows bikers to hang bikes from the front of the saddle, keeping them upright. While taking a break or gearing up for the ride ahead, bicyclists no longer need to find a nearby tree to lean their bike on or a patch of grass to lay their bike down. The Saddle Buddy is not designed as a lockable bike rack, but rather a convenient spot for riders who won’t be leaving bikes unattended. Available in galvanized steel to hold up to the elements. Since 1995, Dero has been supplying innovative bike parking and bicycle transit solutions to architects, contractors, municipalities, higher education, and parks and rec. 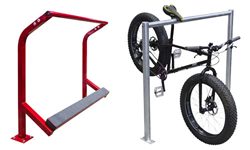 Its bike racks, repair stands and pumps, shelters, and lockers are high quality, thoughtfully designed and secure. Dero also offers the award-winning Dero ZAP, an automatic system to track bike commuters. Dero headquarters is located in Minneapolis and is proud to support biking locally and nationally.